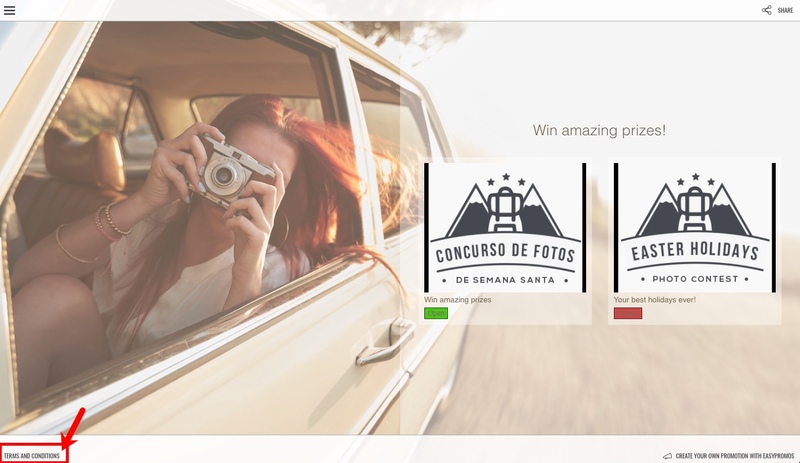 The Promotions Group allows to present a collection of promotions or individual contests on the same page to form a single campaign. In this way, users will remain interested in your promotions and actively engaged during the whole campaign. You can use a single link to communicate all your planned promotions to your followers. Note: In order to create a Promotion Group you must have a Premium or higher monthly subscription. View subscriptions. 4. Purchase the subscription: you can choose between the Premium subscription or the White Label subscription. Remember that you must purchase the subscription of the same version as the promotions you have created and that you want to add to the Group. For example: if you have created the promotions with the Premium version, you must contract the Premium subscription. From this section you can manage the promotions that you wish to add to the group, as well as the individual settings of each of the promotions. Check what type of promotions you can add to a group. 1. Add promotions to the group. Locate the promotion you wish to add in the list 'Promotions you can add', click the arrow on the left and drag and drop the promotion in the 'Promotions of the Group' block. Add to the group as many promotions as you wish. 2. Define the order of the promotions in the group. 3. Remove a promotion from the group. 4. Individual settings of a promotion in the group. Once a promotion is added to the group, new individual settings are available. Setting up of the promotion within the group. 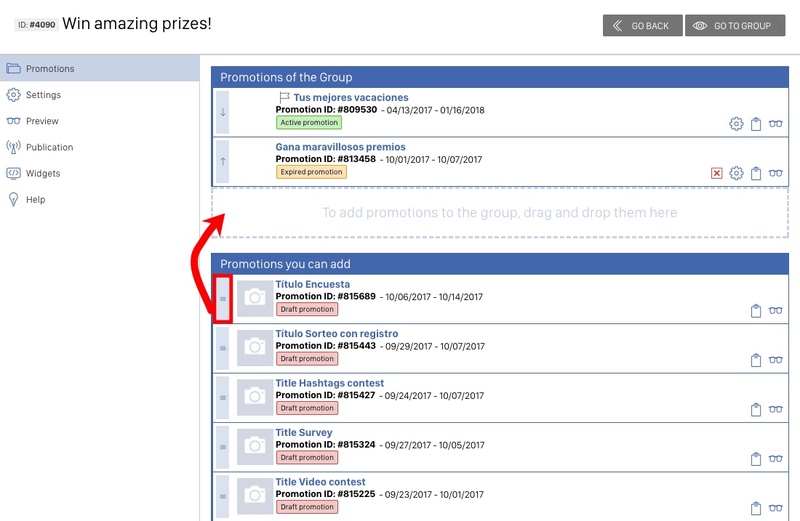 You can edit the text that describes each promotion in the group page, upload a picture adapted to the design of the group page (300 x 245px) and preview what it looks like. The text can include external links. 1. Title. This text will be displayed over the header image of the group. 2. Description. It is displayed below the title and it can be used to describe the campaign or promotional action of the group. It accepts external links. 3. Image. Upload a file that will be displayed in the header of the page group. Its size is 810x360px. 4. Terms and conditions. In this section you can specify the terms and conditions regarding the group. You can configure that these terms and conditions apply for all promotions of the group, or specify different terms and conditions for each individual promotion. If you don't write anything in this field, the 'Terms and conditions' button will not be displayed. 5. Single registration. If you enable this check-box, users will only need to write their registration details the first time they enter a promotion of the group. In they register in future promotions, they will not be required to fill in any additional information. Learn how the single registration works. 6. Global ranking. You can activate a global ranking that gathers the score obtained by all the users in all the promotions of the group that they have entered. Here we explain how the ranking works. 1. Promotions opening mode. You can decide how you want to open the individaul promotion within the group. 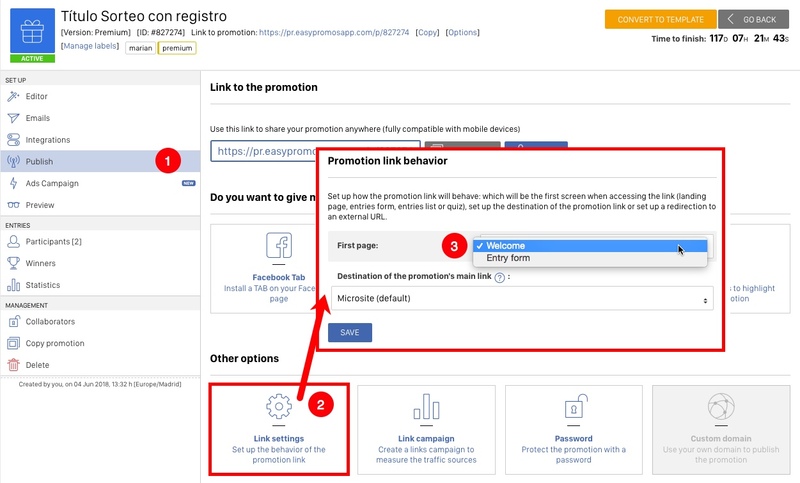 By default, the promotion will open in a modal window, but you can choose to open the promotion in a new tab of the browser, or reload it in the same page. 2. Redirect promotions to the landing page of the group. Enable this option if you want that when the individual promotions are shared or posted, they redirect to the landing page of the group instead of the landing page of each individual promotion. 3. Viral title and description. You can customize the link and description of the viral message that will be communicated when users use the buttons to share the landing page of the group. If any text is specified here, the title and description by default will be used. 4. Viral image. You can customize the image that will be displayed in the publication. Recommended size: 1200x630px. 5. Tweet. You can also customize the text that will be displayed when users share the group on Twitter. 5. Background image. 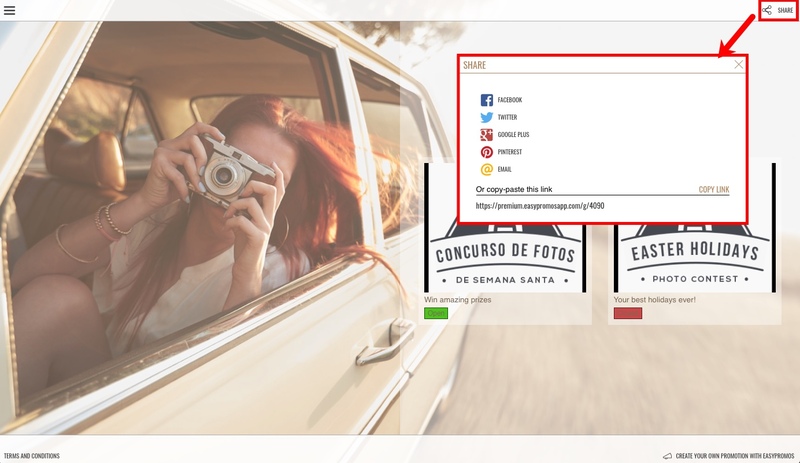 You can set up a background image, which is specially indicated for promotions that redirect to a microsite or Facebook canvas. 7. Powered by. In White Label version, you can even customize the footer of the page with your own brand. Important: Save changes before leaving the 'Settings' menu by clicking the 'Save' button. If you wish to preview the landing page of the group in different devices to check what it looks like in different screen sizes and resolutions, you can click on this option from the menu on the left. Learn all the options to preview the landing page of the group. 1. Obtain the URL of the group, which is compatible with any device. This is the link that you must use in order to communicate the group to your fans and public. 2. Set up the options to install and publish the tab of the group on Facebook. You will be able to embed the page of the group in any website or blog in order to give more visibility to the group and attract more users. This option allows users to see the landing page of the group and enter the promotions right there, with no need to leave the website or blog. 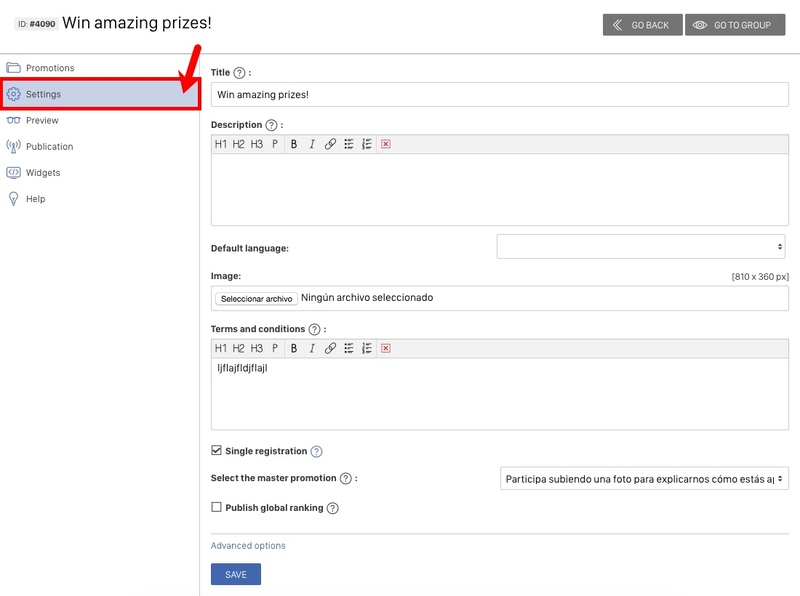 The widget is installed by copying the code provided in this section and pasting it in the website or blog where you wish to embed the promotion. You'll be able to adapt the width and heigth of the widget to fit your website.